Twenty-Five is the national card game of Ireland. Games of Twenty-Five can found be throughout the country, in pubs and homes alike. It is best for three to nine players. Since a game only lasts until a player takes five tricks, games of Twenty-Five are fairly quick, often lasting only two or three hands. The object of Twenty-Five is to be the first player or partnership to reach a score of 25 or more. This is done by winning five tricks. Twenty-Five is played with a standard 52-card deck of playing cards. 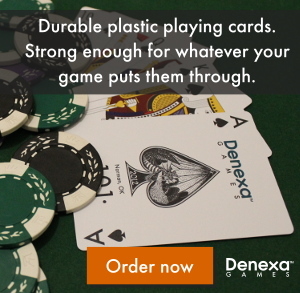 If you have any choice in the matter, insist on using Denexa 100% Plastic Playing Cards.You will also need something to keep score with, such as the time-honored pencil and paper, or something more modern, like a smartphone application. Players divide into teams, depending on the number of people playing and their preferences. With an even number of players, the players may pair up in partnerships. With nine, players may wish to form three teams of three. No matter how many are playing, however, it is always a viable option for each player to play by themselves. If playing with partnerships, partners should sit across from one another, such that as the turn proceeds around the table, no players on the same team take their turns consecutively. Shuffle and deal five cards to each player. Turn the next card (referred to here as the upcard) face up. This sets the trump suit for the hand. Set the deck stub aside; it will not take any further part in game play. Twenty-Five uses an extremely unusual card ranking, which changes depending on which suit is elevated to trumps. Ordinarily, the ace is treated as though it is a one. In the red suits, the cards rank in their usual order. In the black suits, however, the order of the number cards is reversed, with the lowest number cards (the ace, 2, et al.) ranking highest! The adage players use to remember this is highest in red, lowest in black. The order of cards is changed somewhat when a suit becomes trump. The 5 is always the highest trump, followed by the jack. The third highest trump is always the A♥, no matter what the trump suit is. This is followed by the ace of the trump suit (if the trump suit is not hearts), then the rest of the cards in their typical Twenty-Five order. Hearts: (high) 5, J, A, K, Q, 10, 9, 8, 7, 6, 4, 3, 2 (low). Diamonds: (high) 5, J, A♥, A, K, Q, 10, 9, 8, 7, 6, 4, 3, 2 (low). Clubs, Spades: (high) 5, J, A♥, A, K, Q, 2, 3, 4, 6, 7, 8, 9, 10 (low). Hearts: (high) K, Q, J, 10, 9, 8, 7, 6, 5, 4, 3, 2 (low). Diamonds: (high) K, Q, J, 10, 9, 8, 7, 6, 5, 4, 3, 2, A (low). Clubs, Spades: (high) K, Q, J, A, 2, 3, 4, 5, 6, 7, 8, 9, 10 (low). Before actual game play begins, the player holding the ace of trumps (i.e. not the A♥, unless hearts are trump) may rob the upcard that set the trump suit. To do this, they take the upcard and then discard any card from their hand, face down. Of course, by robbing the trump, they are disclosing to the other players that they hold the ace of trumps. As a result, players may sometimes consider it advantageous to waive their right to rob the trump. Once a player has led to the first trick, nobody may rob the trump. Game play begins with the player to the dealer’s left leading to the first trick. 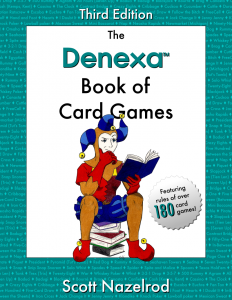 Each player in turn, proceeding clockwise, plays one card to the trick. Players must either follow suit or ruff (play a trump). If a player is unable to follow suit, they may play any card. When a trump is led, the other players must play a trump, if possible, unless the only trump they hold is the 5 of trump, jack of trumps, or A♥ (i.e. the three highest trumps). If these are the only trumps a player holds, they may play any card; they are never forced to play one of the top three trumps. The player that contributed the highest trump to the trick, or the highest card of the suit led, if no trumps were played, wins the trick. That player (or their partnership) immediately scores five points. The player that wins each trick then leads to the next one. If nobody has scored 25 points by the end of the hand, the player to the left of the dealer shuffles and deals another hand. Game play continues until one player or team has scored 25 points. Game play stops immediately (the hand is not played out), with the player or team reaching a score of 25 being the winner.